Fashion jewelry and accessories store La Trendz operates within Singapore’s Anchorpoint shopping centre, at 370 Alexandra Road. 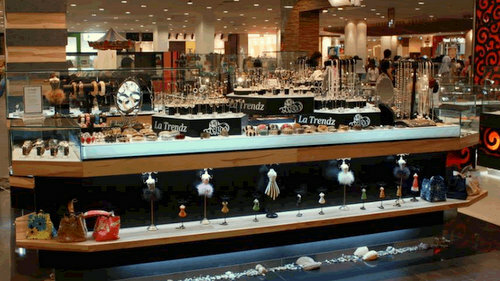 Established in August 2008, La Trendz is a one-stop fashion fashion jewellery and accessories retail concept. Visiting the shop, you can purchase from a range of accessories, bags & purses, jewellery, men’s accessories, watches, household, as well as fashion apparel. The products are imported from various countries, including Italy, Korea, Hong Kong, Taiwan, India, Thailand, Indonesia, Nepal, and Vietnam. Anchorpoint, where the La Trendz store is located, has a great selection of fashion & accessories boutiques. You can visit, for example, Joop (#01-28), Giordano (#01-19), and Hush Puppies Apparel (#01-35) shops at the mall.